WARNING: It is very important to have the right amount of lithium in your body. 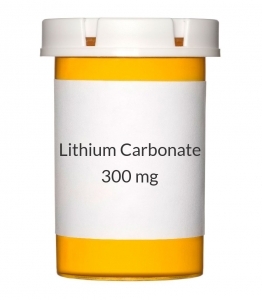 Too much lithium may lead to unwanted effects such as nausea, diarrhea, shaking of the hands, dizziness, twitching, seizures, slurred speech, confusion, or increase in the amount of urine. Tell your doctor immediately if these effects occur. There is only a small difference between the correct amount of lithium and too much lithium. Therefore, it is important that your doctor monitor you closely during treatment. Keep all medical and laboratory appointments while you are taking lithium. USES: This medication is used to treat manic-depressive disorder (bipolar disorder). It works to stabilize the mood and reduce extremes in behavior by restoring the balance of certain natural substances (neurotransmitters) in the brain. Some of the benefits of continued use of this medication include decreasing how often manic episodes occur and decreasing the symptoms of manic episodes such as exaggerated feelings of well-being, feelings that others wish to harm you, irritability, anxiousness, rapid/loud speech, and aggressive/hostile behaviors. HOW TO USE: Take this medication by mouth, usually 3-4 daily or as directed by your doctor. Take lithium with or immediately after meals to lessen stomach upset. Drink 8 to 12 glasses (8 ounces or 240 milliliters each) of water or other fluid each day, and maintain a healthy diet with normal amounts of salt (sodium) as directed by your doctor or dietician while taking this medication. Large changes in the amount of salt in your diet may change your lithium blood levels. Do not change the amount of salt in your diet unless your doctor tells you to do so. Use this medication regularly to get the most benefit from it. To help you remember, take it at the same times each day. Dosage is based on your medical condition, lithium blood levels, and response to treatment. This medication works best if the amount of the drug in your body is kept at a constant level. Therefore, take this drug at evenly spaced intervals. This medication must be taken exactly as prescribed. Continue taking lithium even if your symptoms are improved. Do not stop taking this drug suddenly without consulting your doctor. Some conditions may worsen if the medication is suddenly stopped. Tell your doctor if your condition persists or worsens. It may take 1 to 3 weeks to notice improvement in your condition. SIDE EFFECTS: See also Warning section. Drowsiness, tiredness, increased thirst, increased frequency of urination, weight gain, and mildly shaking hands (fine tremor) may occur. These should go away as your body adjusts to the medication. If any of these effects persist or worsen, tell your doctor or pharmacist promptly. Remember that your doctor has prescribed this medication because he or she has judged that the benefit to you is greater than the risk of side effects. Many people using this medication do not have serious side effects. Tell your doctor immediately if any of these unlikely but serious side effects occur: diarrhea, vomiting, fever, dizziness, unsteady walk, confusion, slurred speech, blurred vision, severe hand trembling (coarse tremor). Tell your doctor immediately if any of these rare but very serious side effects occur: vision changes (e.g., growing blind spot, vision loss), joint swelling/pain, pain/discoloration of finger/toes, cold hands/feet. Get medical help right away if any of these rare but very serious side effects occur: severe dizziness, fainting, slow/fast/irregular heartbeat, shortness of breath, seizures. A very serious allergic reaction to this drug is rare. However, seek immediate medical attention if you notice any symptoms of a serious allergic reaction, including: rash, itching/swelling (especially of the face/tongue/throat), severe dizziness, trouble breathing. This is not a complete list of possible side effects. If you notice other effects not listed above, contact your doctor or pharmacist. In the US - Call your doctor for medical advice about side effects. You may report side effects to FDA at 1-800-FDA-1088. In Canada - Call your doctor for medical advice about side effects. You may report side effects to Health Canada at 1-866-234-2345. PRECAUTIONS: Before taking lithium, tell your doctor or pharmacist if you are allergic to it; or if you have any other allergies. This product may contain inactive ingredients, which can cause allergic reactions or other problems. Talk to your pharmacist for more details. Before using this medication, tell your doctor or pharmacist your medical history, especially of: heart disease, kidney disease, urinary problems (e.g., difficulty urinating), underactive thyroid (hypothyroidism), seizures, Parkinson's disease, leukemia, severe dehydration (severe loss of body water), any infection with high fever, a certain skin disorder (psoriasis). Lithium treatment may infrequently reveal an existing condition that affects the heart rhythm (Brugada Syndrome). Brugada Syndrome is an inherited, life-threatening heart problem that some people may have without knowing it. It can cause a serious (possibly fatal) abnormal heartbeat and other symptoms (such as severe dizziness, fainting, shortness of breath) that need medical attention right away. Brugada Syndrome may cause death suddenly. Before starting lithium treatment, tell your doctor if you have any of the following risk factors: Brugada Syndrome, unexplained fainting, family history of certain heart problems (Brugada Syndrome, sudden unexplained death before 45 years old). This drug may make you dizzy or drowsy or cause blurred vision. Do not drive, use machinery, or do any activity that requires alertness or clear vision until you are sure you can perform such activities safely. Limit alcoholic beverages. If heavy sweating or severe diarrhea occurs, check with your doctor immediately how to best continue taking lithium. Take care in hot weather or during activities that cause you to sweat heavily such as during hot baths, saunas, or exercise. Before having surgery, tell your doctor or surgeon that you are using this medication. Caution is advised when using this drug in the elderly because they may be more sensitive to the effects of the drug, especially the effects on the muscles, nervous system, thyroid, and kidneys. This drug is not recommended for use during pregnancy because of possible harm to an unborn baby (e.g., heart problems, other birth defects). Consult your doctor for more details. Lithium passes into breast milk and may have undesirable effects on a nursing infant. Therefore, breast-feeding is not recommended while using this drug. Consult your doctor before breast-feeding. DRUG INTERACTIONS: Your doctor or pharmacist may already be aware of any possible drug interactions and may be monitoring you for them. Do not start, stop, or change the dosage of any medicine before checking with your doctor or pharmacist first. This drug should not be used with the following medication because a very serious interaction may occur: sibutramine. If you are currently using this medication listed above, tell your doctor or pharmacist before starting lithium. Before using this medication, tell your doctor or pharmacist of all prescription and nonprescription/herbal products you may use, especially of: acetazolamide, ACE inhibitors (e.g., captopril, enalapril, lisinopril), angiotensin receptor blockers (ARBs such as losartan, valsartan), bulk-producing laxatives (such as psyllium), calcitonin, calcium channel blockers (e.g., verapamil, diltiazem, nifedipine), desmopressin, other drugs for mental/mood conditions (e.g., chlorpromazine, haloperidol, thiothixene), methyldopa, metronidazole, nonsteroidal anti-inflammatory drugs (NSAIDs such as celecoxib, ibuprofen, indomethacin, naproxen, piroxicam), anti-seizure drugs (e.g., carbamazepine, phenytoin), SSRI antidepressants (e.g., fluoxetine, fluvoxamine, paroxetine), theophylline, tricyclic antidepressants (e.g., amitriptyline), "water pills" (diuretics such as hydrochlorothiazide, furosemide). Maintain a normal diet with an average consumption of sodium. Consult your doctor or dietician for more details. Avoid products that contain sodium (such as sodium bicarbonate, an ingredient in some types of antacids). This document does not contain all possible interactions. Therefore, before using this product, tell your doctor or pharmacist of all the products you use. Keep a list of all your medications with you, and share the list with your doctor and pharmacist. OVERDOSE: If overdose is suspected, contact your local poison control center or emergency room immediately. US residents can call the US National Poison Hotline at 1-800-222-1222. Canada residents can call a provincial poison control center. Symptoms of overdose may include diarrhea, vomiting, ringing in the ears, blurred vision, trouble walking, unusual drowsiness, seizures, shaking, loss of consciousness. NOTES: Do not share this medication with others. Laboratory and/or medical tests (e.g., kidney function, thyroid function, lithium blood levels) should be performed periodically to monitor your progress or check for side effects. Consult your doctor for more details. Not all brands of this medication are identical. Do not change brands without checking with your doctor or pharmacist first. MISSED DOSE: If you miss a dose, take it as soon as you remember unless your next scheduled dose is within 4 hours. In that case, skip the missed dose and resume your usual dosing schedule. Do not double the dose to catch up. STORAGE: Store at room temperature away from moisture and light. Different forms of this medication have different storage temperatures. Consult your pharmacist or the product labeling for more information. Do not freeze liquid forms. Do not store in the bathroom. Keep all medicines away from children and pets. Do not flush medications down the toilet or pour them into a drain unless instructed to do so. Properly discard this product when it is expired or no longer needed. Consult your pharmacist or local waste disposal company for more details about how to safely discard your product.